Product prices and availability are accurate as of 2019-04-25 16:17:09 UTC and are subject to change. Any price and availability information displayed on http://www.amazon.com/ at the time of purchase will apply to the purchase of this product. Do you have the puppy training blues? Do you frequently come home to puddles of puppy pee pee? Or ruined carpets, gross odors, stained hardwood floors and guilty looking puppy dog eyes? Well you are in luck - the genius engineers at Top Dog have created the solution to your puppy training blues! 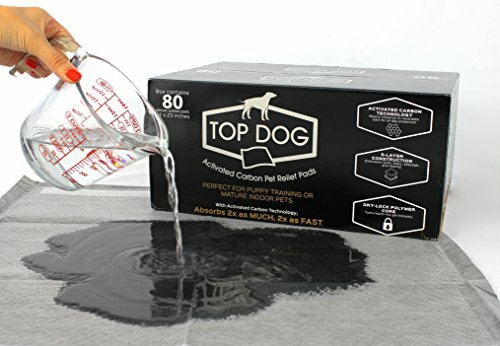 Behold: "Top Dog Activated Carbon Pet Relief Pads." These puppy pads are 25% thicker and 2x more absorbent than those of major name brand competitors. Built with 5-layer construction, our puppy training pads are optimized to ensure your floors stay clean and dry all day long. [*] Layer 1 is our unique Activated Carbon Technology for maximum absorption and minimum odor. [*] Layer 2 is a Super Absorptive Polymer layer that turns liquid into gel instantly! This material is based on technology from USDA labs engineered to hold up to 400x it's weight in fluid. That's a lot of fluid. [*] Layer 3 is a cotton tissue fluff to help lock-in moisture. [*] Layer 4 is a tear-resistant top stretch layer that protects the dog training pads from overzealous pups. [*] The 5th layer is our impermeable plastic bottom, which ensures zero liquid seeps through to your previous floors. Best of all, our pads are black, to minimize the visual impact on your home or apartment! Our large wee wee pads are more absorbent than those of bulk brands like hartz or arm and hammer, we guarantee it, and they fit any standard sized tray or holder. We'd love to hear what you think. Please post a review or drop us a line at info [at] top dog pet and home dot com! Happy Puppy Parenting.